The 8-year-old Utah boy rescued from a frozen pond by a sheriff's officer on Christmas Day is "doing very well," authorities said Wednesday, quoting his family as saying the boy is awake and coherent. The Washington County Sheriff's Office identified the boy only as Jason to protect his privacy. 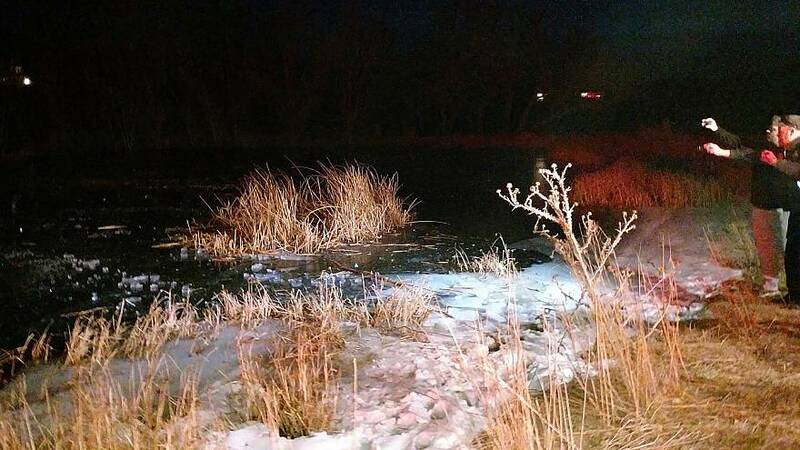 He remained under treatment at a hospital for unspecified injuries late Wednesday, two days after he was submerged for as long as a half-hour in the frigid water in the town of New Harmony, in the southern part of the state, officials said. Jason's family said in a statement released through the sheriff's office that they wanted to thank the public for "the prayers and thoughtful messages they have received during this difficult time." His father described Jason's survival thanks to the heroic efforts of sheriff's Sgt. Aaron Thompson — who dived into the icy pond to retrieve the boy on Monday — as "a Christmas miracle," according to the statement. "The father said Jason's situation has been an example to their family that 'God, hears and answers prayers,'" the sheriff's office said. It said the family would make no further comment for now. Thompson, a rescue diver by training and a former member of the sheriff's dive team, told reporters on Tuesday that he jumped up and down on the ice to break through and then walked across the bottom of the pond on tiptoe, knowing that "eventually I was going to bump into him."